Pro slackers Two Year Vacation have arrived to bring you your very own getaway, the infectious pop version of a memo to your boss telling him to leave you alone for good. They have a shared passion for sun-baked pop anthems, for endless days in the sun and for fancy sundowners by the pool – and their debut Slacker Island is a manifesto for chillaxing the f*** out of yourself. 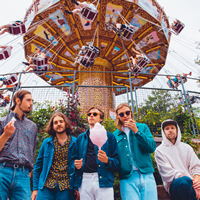 As if latter-day Arctic Monkeys had embodied Two Door Cinema Club's juvenile verve while drinking in the ABBA museum, Two Year Vacation are here to drive out all stale sense of the mundane. They replace it with a carelessness that is just about right to forget the turmoil of the world. For two years now, the band have been working on these tunes, tucked away in their very own bubble within music city Gothenburg with producer György Barocsai. Coming from various backgrounds ranging from Punk to Rock or Heavy Metal, the five members decided to take an altogether different approach. In Two Year Vacation, they all found what they didn't even know they were looking for. The next summer is just a song away – and Slacker Island is open all year round!